Advocate photo by SOPHIA GERMER -- Brass bands march with the Prince "Purple Rain" commemoration secondline parade through the Treme neighborhood in New Orleans, Monday April 25, 2016. Advocate photo by SOPHIA GERMER -- Babydoll Merline Kimble marches during the Prince "Purple Rain" commemoration secondline parade through the Treme neighborhood in New Orleans, Monday April 25, 2016. Advocate photo by SOPHIA GERMER -- Rita Cobb rides a pony in front of the Prince "Purple Rain" commemoration secondline parade through the Treme neighborhood in New Orleans, Monday April 25, 2016. Advocate photo by SOPHIA GERMER -- Marie Francois rides her musical JUST DO IT bike during the Prince "Purple Rain" commemoration secondline parade through the Treme neighborhood in New Orleans, Monday April 25, 2016. 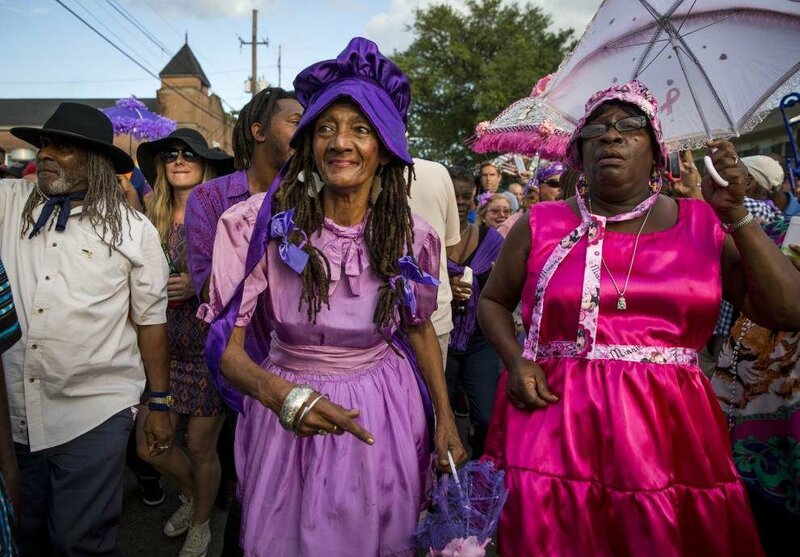 Advocate photo by SOPHIA GERMER -- Goldie Thibodeaux holds a purple umbrella during the Prince "Purple Rain" commemoration secondline parade through the Treme neighborhood in New Orleans, Monday April 25, 2016. Advocate photo by SOPHIA GERMER -- Irma Thomas looks over the crowd during the Prince "Purple Rain" commemoration secondline parade through the Treme neighborhood in New Orleans, Monday April 25, 2016. Advocate photo by SOPHIA GERMER -- Crowds gather on Orleans Avenue before the Prince "Purple Rain" commemoration secondline parade through the Treme neighborhood in New Orleans, Monday April 25, 2016. Advocate photo by SOPHIA GERMER -- Edgar Cooper sits on a carriage during the Prince "Purple Rain" commemoration secondline parade through the Treme neighborhood in New Orleans, Monday April 25, 2016. Advocate photo by SOPHIA GERMER -- Crowds march on Orleans Avenue during the Prince "Purple Rain" commemoration secondline parade through the Treme neighborhood in New Orleans, Monday April 25, 2016. 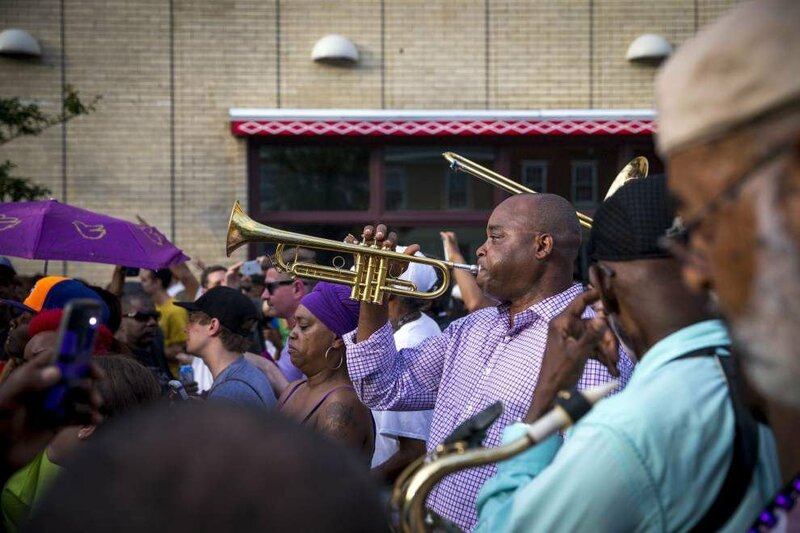 Advocate photo by SOPHIA GERMER -- Brass bands march during the Prince "Purple Rain" commemoration secondline parade through the Treme neighborhood in New Orleans, Monday April 25, 2016. A large crowd marched during the Prince "Purple Rain" commemoration second line parade through the Treme neighborhood in New Orleans on Monday. Prince was found dead at his home this past Thursday. Having trouble seeing video below? Click here.